Nine boss Hugh Marks says the broadcaster has delivered its most successful slate of programming in recent times, rolling out a succession of family-friendly hit programs across the year. Nine has performed strongly both on television and digital video, with its primary TV channel having shown considerable share and audience growth in 2017 across all the key demographics, and also total people. “A year ago at the Nine Upfront, I spoke about how in 2017 we would look to lift the ratings performance and consistency of our schedule,” Marks said. 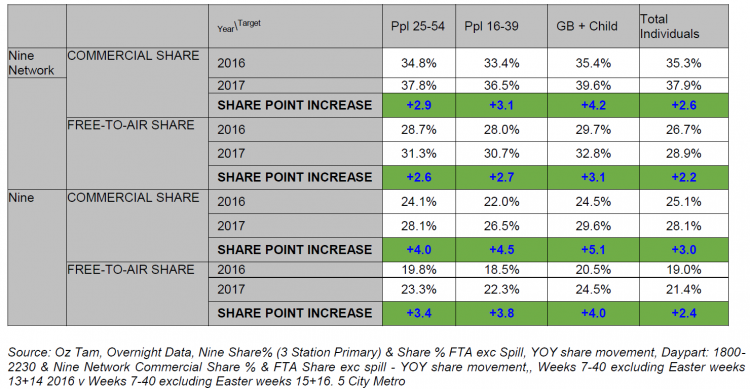 “With more than 2.6 share points of growth in prime time on Channel Nine across all of the key demographics that matter most to you, I feel we have delivered. Married at First Sight is up by 19 per cent year-on-year with people 16 to 39 and by more than 20 per cent with total people. The Block, currently on air and celebrating its 13th series, is showing no signs of slowing down, with audiences for this series up by 20 per cent.